Hundreds of people turned out for the Central Pennsylvania Women’s March in State College Saturday. The event was one of many held across the country. Among those rallying was Libby Gage, there with her 16-year-old daughter. Protestors waved signs, chanted and cheered. They made their way from the gates of Penn State to the State College borough building. There, speakers advocated for women’s rights, racial equality, believing victims of abuse and protecting children. Anne Ard, director of the Centre County Women Resource Center, singled out one sign for its message. Some of the speakers, including Centre County District Attorney Bernie Cantorna, took aim at politicians like Donald Trump. “We must say thank you to the current administration because he lit a spark and it set a wildfire and it’s coming to Washington," Cantorna said. Organizers encouraged participants to register to vote and stay active politically. On a chilly Saturday afternoon in State College, among busy downtown traffic, Salvation Army bell-ringers and even a wedding photo shoot, a group of about twenty people solemnly stood at the gates of Allen Street. The group gathered for a protest in the wake of Michael Brown and Eric Garner’s deaths. 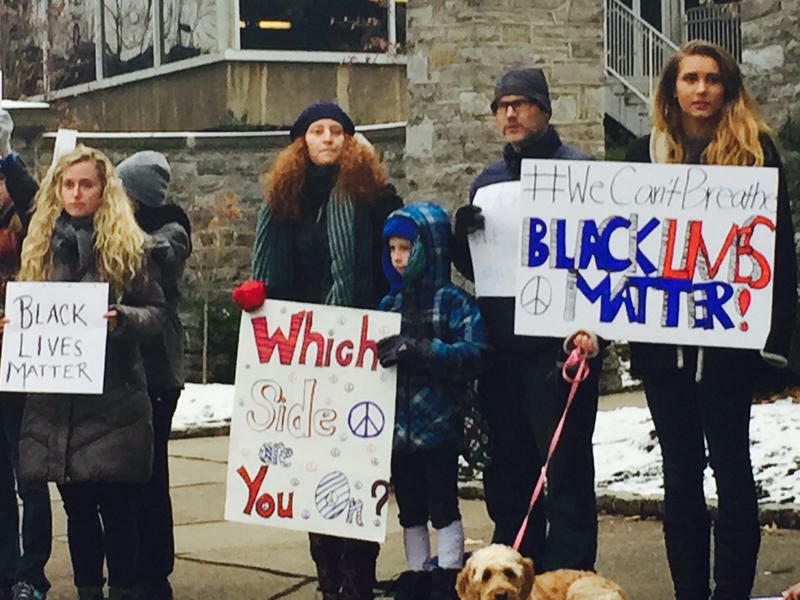 This was the latest of several rallies in State College, some in support of law enforcement but most, like Saturday’s, to protest police brutality and institutionalized racism. It's been about a year since Donald Trump took office. For some women in Central Pennsylvania it's been a very difficult year. Cindy Simmons caught up with a few of them for WPSU. State College locals protested Wednesday against the GOP’s attempts to repeal the Affordable Care Act. Around 15 people held up signs outside the Allen Street Gates. Webster’s Bookstore Café owner Elaine Meder-Wilgus held a sign shaped like a tombstone. She said she’s seeing a lot of misinformation on the Affordable Care Act.